Every summer over much of the United States, we brace ourselves for heat waves. During these periods, the air turns muggy and usually smoggy. After a few days, a cold front moves in, sweeping away the pollution and ending the heat. Given that we are on a path towards global warming, atmospheric chemists are asking how climate change could affect air quality. Will warmer temperatures mean more pollution during these episodes? Will episodes last longer? Most importantly, what effect will changes in air quality have on human health? The recent retreat of ice shelves on the Antarctic Peninsula has been widely attributed to warming atmospheric temperatures. There is, however, little published work describing the response of glacier margin positions to this regional climate change. 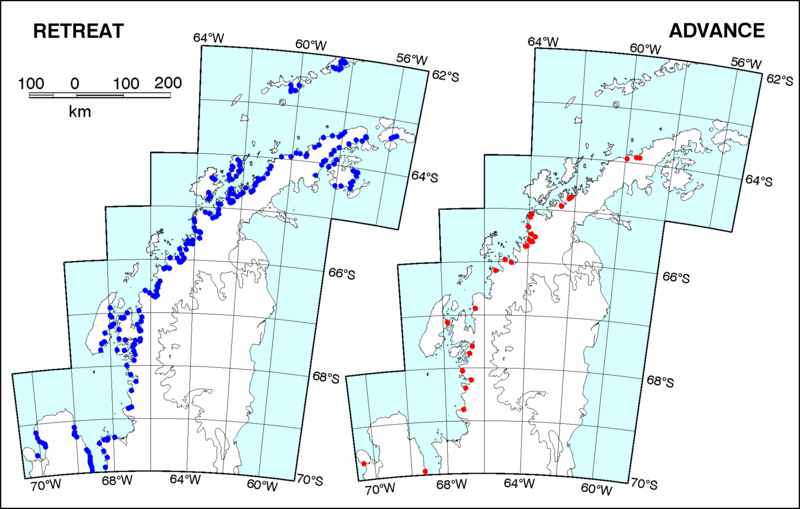 In the paper Retreating Glacier Fronts on the Antarctic Peninsula over the Past Half-Century published this week in Science, we presented new data describing trends in 244 marine glacier fronts on the Antarctic Peninsula over the last 50 years. The data come from matching archives of over 2000 aerial photographs of the Antarctic Peninsula to satellite images, and represent about three years of work by Alison Cook. The work was carried out at British Antarctic Survey, but was funded by the US Geological Survey, as part of a larger programme to map change in the coastline of all Antarctica. One of the most common mistakes that we have observed in discussions of climate and atmospheric change is confusion between the rather separate concepts of ozone depletion and global warming. This isn’t necessarily surprising given the scant information that most people pick up from the media. However, for many years meteorologists have been fighting a rearguard action to persuade people that the globe isn’t warming because there is more sun coming through the ozone hole. There are however important connections between the two issues that complicate potential actions that we might take to alleviate the different problems. This week, for instance, a new IPCC report was released that looked at the greenhouse warming potential of many of the replacement chemicals (HFCs and HCFCs) that were used to replace CFCs in aerosol cans and refrigeration units under the Montreal Protocol (and subsequent amendments). Whenever three or more contrarians are gathered together, one will inevitably claim that water vapour is being unjustly neglected by ‘IPCC’ scientists. “Why isn’t water vapour acknowledged as a greenhouse gas?”, “Why does anyone even care about the other greenhouse gases since water vapour is 98% of the effect?”, “Why isn’t water vapour included in climate models?”, “Why isn’t included on the forcings bar charts?” etc. Any mainstream scientist present will trot out the standard response that water vapour is indeed an important greenhouse gas, it is included in all climate models, but it is a feedback and not a forcing. From personal experience, I am aware that these distinctions are not clear to many, and so here is a more in-depth response (see also this other attempt). A “consensus view” amongst climate scientists holds that the Northern Hemisphere will be warming this month, as spring is coming. This is thought to be due to the Earth’s orbit around the sun and the inclination of the Earth’s axis, tilting the Northern Hemisphere progressively towards the sun throughout March and April and increasing the amount of solar radiation received at northern latitudes. In a new novel, State of Euphoria, bestselling author Michael Crikey uncovers major flaws in this theory and warns against false hopes for the arrival of spring.